What is a Work Type? A "Work Type" is a unit that determines what or how a worker is paid. Payable can accommodate any kind of work or method that you might use to calculate contractor compensation. This can be any common way to pay independent contractors such as Hourly, by the Project, Day Rate, etc. Or something more specific, like Photographs, Deliveries, Articles, or anything other unit of measuring the output of your contractors. Work Types can also be something totally unique to your business - pay writers by the word? Use a "Words" work type. Workers who get a percentage of revenue they generate? Create a monetary "Commissions" work type. Pay your Brand Ambassadors by the number of new users they sign up? No problem. Any which way you pay, Payable can handle it. To create custom Work Types, simply go to Lists > Work Types > Add Work Type. The Quantity Measure allows for further flexibility in accommodating unique and/or specific ways to pay. Time, Money, Distance and Units are the available Quantity Measures. Don't forget to add a default rate for each Work Type. This default rate will be used when no specific Worker or Service rates have been added. Remember: If you're using them, a Service's rate will always override the default and an individual contractor's rate will override everything. Custom Work Types can always be tweaked, edited or changed to reflect your evolving compensation structures. Once entered, they will show up on the Work page in whichever order they are organized in under Lists. To inactivate a Work Type, open its form on the Lists page and click the "Inactivate" button. After inactivating a Work Type, it will appear under the "Inactive Work Types" sublist. 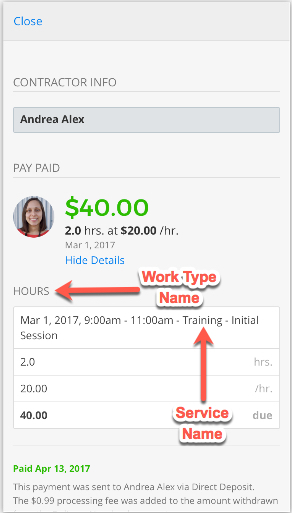 Existing work for that Work Type will still show up in the Work page for your records. The gray accent color indicates that a Work Type is currently inactive. Also, any payments for that existing Work Type will remain unchanged. If a Work Type ever needs to be reactivated again, open its form on the Lists page and click the "Activate" button. A "Service" is a category of something more specific within the Work Type. 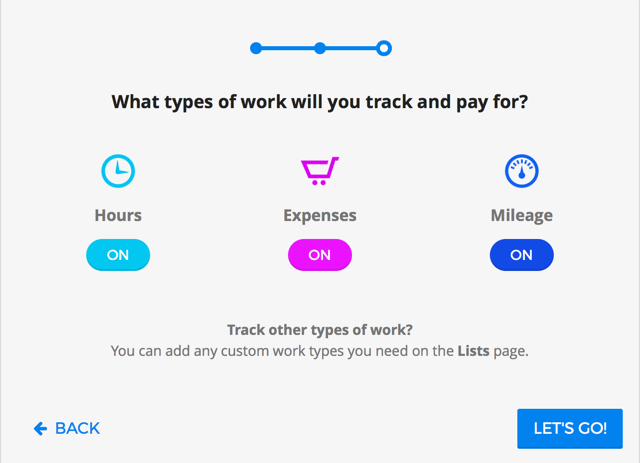 Payable can accommodate any list of Services that you might use to calculate contractor compensation and that are unique to your business. So for instance, Hours is the Work Type, but for what hours are you paying your contractor for? An example might be Technical Support or QA. Both services are paid hourly, and each is paid at a different rate.